Click here to join the Facebook Group for Doctor Pickens Museum of Turquoise Jewelry. In 1908 E. W. Marland came to Oklahoma after losing his fortune in the Pennsylvania oil fields in the panic of 1907 and by 1920 had reestablished himself and started the Marland Oil Company in Ponca City with a fortune estimated at $85 million (roughly $910 million in modern dollars). Marland was a visionary and not only pioneered the use of geophysical techniques in the oil industry but was years ahead of his time as an employer providing housing, loans, medical care, and other benefits for the thousands of employees who worked at his refineries and pipelines. But misfortune would strike Marland and in 1928 his oil empire was destroyed by J.P. Morgan's banking interests. Marland was forced out of the oil company he had founded when bankers merged it with Continental Oil Company and renamed the company Conoco. Commissioned by oilman E. W. Marland and erected in 1930, the Pioneer Woman statue stands at the center of Ponca City’s civic life. The result of a sculptural competition, twelve of the world’s leading artists each produced a three foot bronze of their conception of the Pioneer Woman. The bronzes toured the United States and were a sensation in New York City where they were viewed by hundreds of thousands of people at the Reinhardt Galleries and written up in Time Magazine and by the New York Times. Over 750,000 cast votes for their favorite and Bryant Baker’s “Confident” was the selection of the people. The twelve original bronzes from the competition are still in existence and since 1940 have been at Woolaroc Museum located near Bartlesville, 75 miles from Ponca City. This is the story of the Pioneer Woman Models. Carl Renfro and his wife Carolyn have been involved with the community of Ponca City ever since they came to Ponca in 1968. Carolyn was on the first Marland Estate Commission after the city purchased the mansion in 1976 and served two terms on the initial commission. 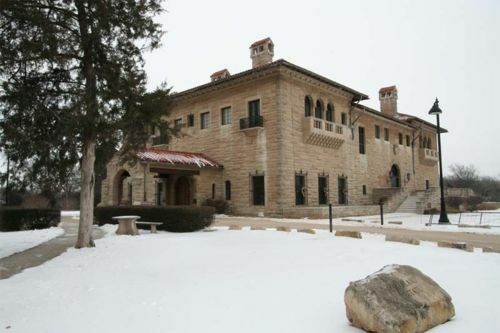 In 1994 and 1995 Carl was Chairman of the Marland Estate Commission and under his tenure he started the Marland Estate Foundation which is the organization that raises money to restore and to help furnish the mansion to its original condition. “Over the years we have had a great love for the mansion and we endowed the mansion with a grant to help with restoration of the mansion,” says Renfro adding that his wife Carolyn still serves on the Marland Estate Foundation. In 1926 before losing his fortune, Marland decided to build a monument to the disappearing West and began a project to build a statue of the "Pioneer Women" in the city that he had made his home. A trip almost fifty years back in time reminded me of the unique nationwide sculptural competition to create a monument to the Pioneer Woman and I decided to investigate to discover the story of how the Pioneer Woman statue ended up in Ponca City while the models for the monument ended up in Frank Phillips' Woolaroc Museum an hour and a half drive away. This is the story of the Pioneer Woman Models. To understand the story of the Pioneer Woman Models you have to go back over a 100 years. In 1908 E. W. Marland came to Oklahoma after losing his fortune in the Pennsylvania oil fields in the panic of 1907 and by 1920 had reestablished himself and started the Marland Oil Company in Ponca City with a fortune estimated at $85 million (roughly $910 million in modern dollars). Marland was a visionary and not only pioneered the use of geophysical techniques in the oil industry but was years ahead of his time as an employer providing housing, loans, medical care, and other benefits for the thousands of employees who worked at his refineries and on his pipelines. But misfortune would strike Marland and in 1928 his oil empire was destroyed by J.P. Morgan's banking interests. Marland was forced out of the oil company he had founded when bankers merged it with Continental Oil Company and renamed the company Conoco. Marland was given the opportunity to remain on in an honorary position as Chairman of the new company as long as he would agree to leave Ponca City. Morgan Bank didn’t want Marland in town undermining the authority of the new General Manager brought in to run Marland’s old company. Marland chose to forgo the position so he could remain in the city that he had made his home. Two years earlier, before losing his fortune, Marland had decided to build a monument to the disappearing West and began a project to build a statue of the "Pioneer Women" in Ponca City, the city where Marland had made his fortune and lived for almost twenty years. In 1926 Marland commissioned twelve 3-foot sculptures that were submitted by US and international sculptors as models for the Pioneer Woman statue. Marland paid each sculptor $10,000 for his submission, equivalent to about $100,000 for each model in US dollars today. Marland told the sculptors to pay tribute to “the pilgrim mothers, the Puritan women, the mothers of the south, the sturdy broods." "All races, all creeds, all nationalities gave their best and bravest women," added Marland. Marland's first idea was to have the figure of a woman accompanied by a child and dressed in pioneer dress characterized by a sunbonnet. For this purpose a sunbonnet was sent to each sculptor. Later the artists were given a free hand, but nevertheless in the final submissions each figure had a sunbonnet, and with the exception of Jo Davidson's model each woman is pictured with a child. The twelve submissions included "Protective" by John Gregory; "Determined" by Maurice Sterne; "Challenging" by H.A. MacNeil; "Affectionate" by James E. Fraser; "Self-Reliant" by A. Stirling Calder; "Fearless" by Wheeler Williams; "Heroic" by Mario Korbel; "Adventurous" by F. Lynn Jenkins; "Sturdy" by Mahonri Young; "Faithful" by Arthur Lee; "Trusting" by Jo Davidson; and "Confident" by Bryant Baker. The models were taken on a tour of the country in a special railroad car and shown in Ponca City, New York, Boston, Philadelphia, Pittsburgh, Detroit, Chicago, Minneapolis, St. Paul, Dallas, Fort Worth and Oklahoma City where they were viewed by 750,000 people who cast votes for their favorite. The New York Times reported that on February 26, 1927 Marland hosted a dinner at the Hotel Plaza in New York City for the twelve sculptors who had submitted models. Marland paid tribute to the wives of the pioneers who, he said, had never been sufficiently appreciated. "Pictures have we in plenty of the stern Pilgrim Fathers and the gallant gentlemen of the friendlier Virginia soil," said Marland, "but we are forced to draw on our imagination somewhat for pictures of the mothers. The toll of life resulting from their hardships left millions of unmarked graves across this continent, graves of women who died that we might live and love this homeland." The New York Times reported on March 27, 1927 that the exhibition had arrived in New York City and that it had attracted "more interest than any exhibition of sculpture New York has known in a long while." The twelve models were exhibited from February 26 to March 19 in the Reinhardt Galleries at 730 Fifth Avenue in an exhibition called "Pioneer Woman in America." Bryant Baker's model was the winner of the first place in the New York balloting. The Times reported that "Baker not only won first honors, but was the last man to enter the contest having no more than a month to prepare his model and obtain a casting." Marland pronounced himself pleased with the models. "I believe all of the sculptors have done well," said Marland. "We could select any one of the twelve figures and get an excellent interpretation of the frontier woman. The decision will be a hard one to make. I expect to be guided largely by public taste, but the final decision will be my own. This national vote is going to show exactly what the American people think about one of the greatest of their women," Marland added. The exhibition touched a popular chord in American culture of the time. The New York Times reported on March 27, 1927 that among those who visited the exhibition at the Reinhardt Galleries was 91 year old Betty Wollman who as a young bride had journeyed from St. Louis to Leavenworth Kansas in 1855 and had once entertained Abraham Lincoln as a dinner guest in the Wollman household in Leavenworth long before Lincoln was a candidate for President. Wollman spoke about women's role during pioneer days in the old west and congratulated Marland for his proposal to erect a statue to the Pioneer Woman. "Mr. Marland is to be congratulated for doing this in commemoration of these early women of the West," said Wollman. "The hardships were many, and the courage and self-denial of the women who worked side by side with their husbands and sons and brothers in those primitive days are largely responsible for the development of the Middle Western States, now so rich in everything that goes to make life worth living." On December 21, 1927 Marland's adoptive son, George Marland, announced at Bernhardt Gallerie in New York City that Bryant Baker's model “Confident” had been picked, winning the commission and the $100,000 prize. The popular vote showed Bryant Baker's model had been the favorite in eleven cities, while the model submitted by John Gregory received highest vote in three cities. 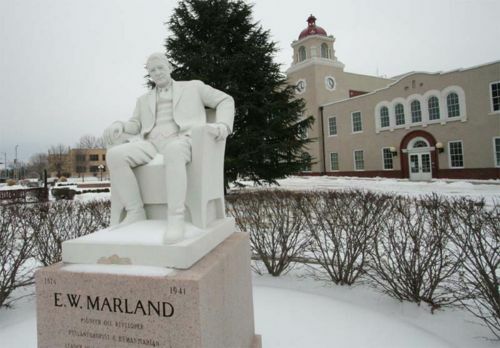 It is believed that Marland's personal favorite was "Trusting" by Jo Davidson who had also sculpted the statue of Marland on the town plaza of Ponca City. Baker's model shows a young woman leading her small son by the hand. "On her right arm the woman carries a bundle, representing the burden of life and all her worldly goods," reported the New York Times. 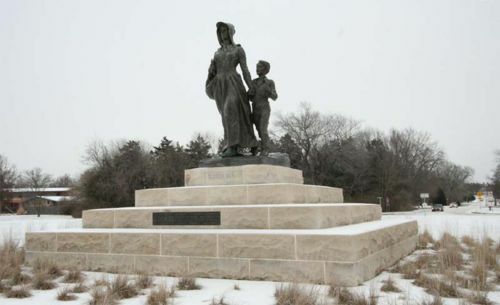 "Under her right arm she holds a Bible, which Mr. Baker said ‘was a vital factor in building up this country.’"
In conceiving the Pioneer Woman Statue, it is reported that Baker had received inspiration from the frontier story of Mary Kelly Hurley and her young son Patrick Jay Hurley who would later serve in Herbert Hoover's administration as Secretary of War. Hurley, the first Oklahoman to serve in a Presidential cabinet, was born in poverty in the Choctaw Nation in Indian Territory in 1883, and would later speak at the unveiling of the Pioneer Woman statue. Baker and his assistant Donald De Lue completed the 17-foot bronze of the Pioneer Woman in less than sixteen months and shipped the 6 ton statue by train from New York City to Oklahoma. Baker's sculpture was unveiled in Ponca City in a public ceremony on April 22, 1930 on the anniversary of the 1893 opening of the Cherokee Outlet. Forty thousand guests including Marland’s old friend Frank Phillips came to hear Will Rogers pay tribute to Oklahoma's pioneers. "The Pioneer Woman's composite character is the character of our nation," added Secretary of War Patrick Hurley, a native Oklahoman, speaking to the crowd by radio from his home in Washington, DC. "These women who came here at the opening of this country were the bulwark standing between civilization and barbarism." The finished statue of the Pioneer Woman Statue weighed 12,000 pounds and was thirty feet high from the bottom of her pyramid limestone base to the top of her sunbonnet. Marland deeded the statue and the 5-1/2 acre park it was located on to Governor Holloway as a gift to the state of Oklahoma. The dedication ceremony for Marland may have been bittersweet. Marland was broke and no longer had the money to complete the project writes Michael Wallace in his biography of Frank Phillips. "Completion of the project was secretly paid off by Lew Wentz, another Ponca City oil tycoon, and, ironically, a bitter Marland rival," says Wallace. But Marland was in good spirits as he greeted his old friend Frank Phillips who had flown over from Bartlesville to attend Marland’s dedication ceremony. "Wearing a top hat and cutaway, Marland was smiling and seemed pleased by a large turnout for the dedication ceremony. Frank squeezed Marland's hand and wished him well." After Marland lost Marland Oil Company, he decided to dedicate his life to public service. In 1932 Marland was elected to the United States House of Representatives to represent Oklahoma’s 8th Congressional District, the first Democrat to hold that seat in 15 years. On January 15, 1935, Marland was inaugurated as Governor of Oklahoma. Immediately, Marland instituted a policy that would become known as the "Little New Deal." Despite Governor Marland’s efforts, most politicians in Oklahoma never fully embraced the New Deal but by the end of Marland's term as Governor, WPA projects had created jobs for over 90,000 Oklahomans on over 1,300 projects and the Legislature had accepted Marland's proposal for a homestead exemption provision to the state’s ad valorem taxes, increased school funds, and raising the state sales tax to two percent with funds raised by the sales tax to go towards the handicapped, the elderly, and dependent children. Marland’s term as Governor ended in 1939 and under Oklahoma law he could not succeed himself so he returned to Ponca City to live out his final days. Already ill, on March 11, 1940 Marland wrote a letter to his old friend Frank Phillips. "My financial condition compels me to sell objects of art, tapestries, bronzes, rugs, and paintings acquired by me in more prosperous years," wrote Marland. "I will sell at a price approximately 25 per cent of their cost to me... And will consider it a kindness if you will come yourself or send someone to look them over with the object of buying anything you fancy." Phillips sent art expert Gordon Matzene to inspect the bronzes and Pat Patterson, first director of Woolaroc Museum, to negotiate for their purchase. The models were sold to Phillips and removed from Ponca City along with “Pioneer Man” by Bryant Baker and “The Indian.” “The Squaw,” “The Cowboy,” and “Belle Starr” by Jo Mora to became part of Phillips' collection at Woolaroc. “We executed an agreement with the Frank Phillips Foundation in September 2009,” says Renfro. The agreement states that all costs for having the reproductions made would be born by Carl and Carolyn Renfro and that the statues would be donated by them to the Marland Mansion Foundation. The agreement added that it was the intent of the Renfros to make the reproductions available to be seen by the public at the Marland Mansion, that under no circumstances would additional reproductions be made of the statues, and that the role of the Frank Philips Foundation for making this gift possible would be acknowledged in the display of the reproductions. "It has been very nice to get involved in this project," says John Free, owner of the Bronze Horse Foundry in Pawhuska where the reproductions are being made. "We have done a lot of work for Woolaroc in the past and this is a historic project. We are just glad that we were able to get involved in getting the Pioneer Women back over to Ponca City." Making a copy of each statue is a multi-step process that takes several months from start to finish. "First we make a rubber mold of each statue," says Free. "Then we use that rubber mold to make a wax copy of the original statue. We take the wax copy and build a ceramic mold around the wax. Then we will put the ceramic mold in a furnace and burn out all the wax. At that point we will fill the cavity in the ceramic mold back up with hot bronze, let it set, then break the ceramic mold off the bronze piece and clean it. For a reproduction of this size we will usually have to make each reproduction in two or three different sections so we fit the sections back together, weld them, grind them, finish them, and deliver the finished reproduction to the Marland Mansion. It takes us about ten days to make the mold depending on how complicated the piece is. Then it takes us about two months after that to pour the wax pattern, make the ceramic mold and finish it out. There is probably sixty to eighty hours of skilled labor that go into each reproduction." "The finished reproduction and the original statue are almost identical," adds Free. "You would have to put the original side by side with the reproduction to see any difference. The only thing that actually changes between the original and the reproduction is because you are making a rubber mold, the reproductions are slightly smaller than the originals. Every time you pour hot bronze into a mold, the bronze shrinks just a little bit as it cools so while the original models are three feet tall, the reproductions we are making might be three-eighths of an inch shorter. The other difference is that the originals are over eighty years old so with the passage of the years they have taken on a slightly verde patina. The reproductions will start out in Ponca City with a darker brown than the originals but as they are exposed to the environment, they will take on a slightly different color too." “My wife Carolyn and I got involved with bringing the Pioneer Woman models back to Ponca City because we love the mansion and we love the history of the Marland era and we wanted to bring it back as much as we could,” says Renfro. "Like anybody else you don’t do it for the recognition but I think people in the business community are aware of the fact that my wife and I deeply love this community and we are trying to give back. The years that I spent and made a decent living and was able to accumulate assets, I realize that the only reason that I have those assets now is because of the people of Ponca City. So being able to give back in some small way is something that we really wanted to do while we are still alive." Carl and Carolyn Renfro, Bob Fraser, and many others have been modern day caretakers of the dreams of E. W. Marland and Frank Phillips that their cities work together. We have them to thank for what has been accomplished and for helping us recognize what still remains to be done. The Pioneer Woman Models Come Home" by Hugh Pickens. Archived Copy February 26, 2010. The Pioneer Woman Models July 13, 2007. 2. The Papers of Will Rogers: The Final Years, August 1928 - August 1935 by Will Rogers, Steven K. Gragert, M. Jane Johansson. University of Oklahoma Press. 2006. 3. “Ponca City and Kay County Boom Towns” by Clyda Franks. Arcadia Publishing. 2002. 4. “Frank's Fancy: Frank Phillips' Woolaroc” by Gale Morgan Kane, published 2001 by Oklahoma Heritage Association. 5. “Mahonri Young: His Life and Art, Signature Books” by Thomas E. Toone, Salt Lake City, 1997. 6. “Oil Man: the Story of Frank Phillips and the Birth of Phillips Petroleum” by Michael Wallis. St. Martin's Press. 1995. 7. "The Sculpture of Donald De Lue: Gods, Prophets, and Heroes" by D. Roger Howlett. 1990. 8. "Between Sittings" by Jo Davidson. 1951. 9. "Life and Death of an Oilman: The Career of E.W. Marland" by John Joseph Mathews. University of Oklahoma Press. 1951. 1. Interview with Carl Renfro by Hugh Pickens on February 15, 2010. 2. Interview with Bob Fraser by Hugh Pickens on February 19, 2010. 3. Interview with John Free by Hugh Pickens on March 2, 2010. 1. New York Times. "Pioneer Woman in Bronze" February 22, 1927. 2. New York Times. "Marland Praises Women Pioneers; Describes Hardship at Dinner for 12 Sculptors Competing for Huge Memorial." February 26, 1927. 3. New York Times. "Public to Decide on Art" February 27, 1927. 4. New York Times. "Pioneer Woman Seen in Bronze." March 20, 1927. 5. New York Times. "Vote on Pioneer Woman" March 20, 1927. 6. New York Times. "Statue of the Pioneer Woman Stirs Memories of Long Ago." March 27, 1927. 7. Time Magazine. "Art: Pioneer" March 28, 1927. 8. New York Times. "Pupils Analyze Pioneer Women" April 3, 1927. 10. New York Times. "Marland Names Winner Among 12 Sculptors for Monument in Oklahoma." December 21, 1927. 11. Time Magazine. "Pioneers" January 2, 1928. 12. New York Times. "The Pioneer Woman Praised by Hoover." April 23, 1930. 13. "Two Oklahomans Honored" by Charles Evans. Chronicles of Oklahoma. January 25, 1951. 14. "Monument Road Once Lined With Prominent Statues" by Louise Abercrombie. The Ponca City News. October 21, 1996. 16. 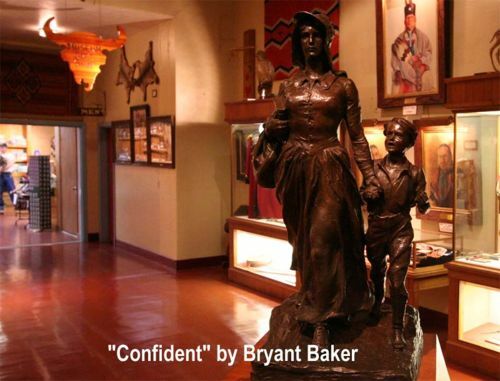 "Only in Oklahoma: Pioneer Woman's Spirit Preserved in Bronze" by Gene Curtis. Tulsa World. April 27, 2009. ↑ Interview with Carl Renfro by Hugh Pickens on February 15, 2010. ↑ Interview with Bob Fraser by Hugh Pickens on February 19, 2010. ↑ "Life and Death of an Oilman: The Career of E.W. Marland" by John Joseph Mathews. University of Oklahoma Press. 1951. ↑ “Mahonri Young: His Life and Art, Signature Books” by Thomas E. Toone, Salt Lake City, 1997. ↑ New York Times. "Vote on Pioneer Woman" March 20, 1927. ↑ New York Times. "Public to Decide on Art" February 27, 1927. ↑ New York Times. "Marland Praises Women Pioneers; Describes Hardship at Dinner for 12 Sculptors Competing for Huge Memorial." February 26, 1927. ↑ New York Times. "Pioneer Woman Seen in Bronze." March 20, 1927. ↑ New York Times. "Pioneer Woman in Bronze" February 22, 1927. ↑ New York Times. "Statue of the Pioneer Woman Stirs Memories of Long Ago." March 27, 1927. ↑ New York Times. "Pupils Analyze Pioneer Women" April 3, 1927. ↑ Time Magazine. "Art: Pioneer" March 28, 1927. ↑ New York Times. "Marland Names Winner Among 12 Sculptors for Monument in Oklahoma." December 21, 1927. ↑ "Between Sittings" by Jo Davidson. 1951. ↑ Time Magazine. "Pioneers" January 2, 1928. ↑ The Papers of Will Rogers: The Final Years, August 1928 - August 1935 by Will Rogers, Steven K. Gragert, M. Jane Johansson. University of Oklahoma Press. 2006. ↑ "Two Oklahomans Honored" by Charles Evans. Chronicles of Oklahoma. January 25, 1951. ↑ "The Sculpture of Donald De Lue: Gods, Prophets, and Heroes" by D. Roger Howlett. 1990. ↑ New York Times. "The Pioneer Woman Praised by Hoover." April 23, 1930. ↑ "Only in Oklahoma: Pioneer Woman's Spirit Preserved in Bronze" by Gene Curtis. Tulsa World. April 27, 2009. ↑ “Frank's Fancy: Frank Phillips' Woolaroc” by Gale Morgan Kane, published 2001 by Oklahoma Heritage Association. ↑ "Monument Road Once Lined With Prominent Statues" by Louise Abercrombie. The Ponca City News. October 21, 1996. ↑ “Ponca City and Kay County Boom Towns” by Clyda Franks. Arcadia Publishing. 2002. ↑ “Oil Man: the Story of Frank Phillips and the Birth of Phillips Petroleum” by Michael Wallis. St. Martin's Press. 1995. ↑ Interview with John Free by Hugh Pickens on March 2, 2010. Dr. Pickens married Hugh Pickens on December 24, 1984 with whom she recently celebrated 32 years of marriage. Hugh Pickens (Po-Hi '67) is a physicist who has explored for oil in the Amazon jungle, commissioned microwave communications systems across the empty quarter of Saudi Arabia, and built satellite control stations for Goddard Space Flight Center in Australia, Antarctica, Guam, and other locations around the world. Retired in 1999, Pickens and his wife of 33 years moved from Baltimore back to his hometown of Ponca City, Oklahoma in 2005 where he cultivates his square foot garden, mows five acres of lawn, writes about local history, photographs events at the Poncan Theatre, produces the annual Oklahoma Pride series with his wife at Ponca Playhouse, and recently sponsored the first formal dinner in the Marland Mansion in 75 years. Pickens is presently in the process of planning the construction of an Art Museum in Northern Oklahoma. Pickens can be contacted at hughpickens@gmail.com. In 1996, Pickens edited and published My Life In Review: Have I Been Lucky of What?, the memoirs of Jack Crandall, professor of history at SUNY Brockport. 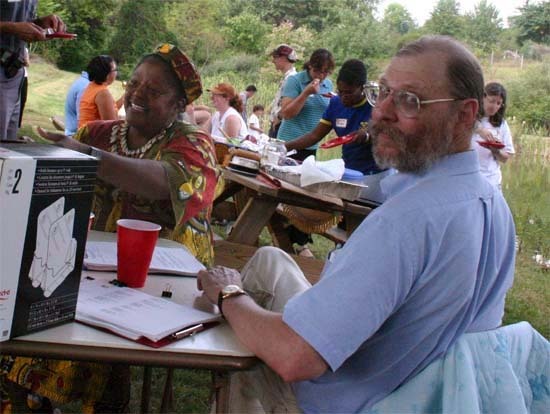 Since 2001 Pickens has edited and published “Peace Corps Online,” serving over one million monthly pageviews. Pickens' other writing includes contributing over 2,000 stories to “Slashdot: News for Nerds,” and articles for Wikipedia, and “Ponca City, We Love You”. Pickens has written the following articles available on his wiki at Research and Ideas. Ponca Playhouse Presents: August Osage County"
Conoco and Phillips 66 announced on November 18, 2001 that their boards of directors had unanimously approved a definitive agreement for a "merger of equals". The merged company, ConocoPhillips, became the third-largest integrated U.S. energy company based on market capitalization and oil and gas reserves and production. 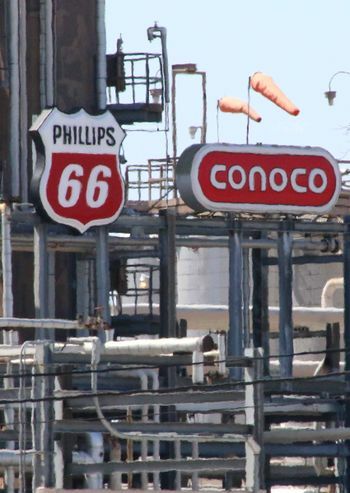 On November 11, 2011 ConocoPhillips announced that Phillips 66 would be the name of a new independent oil and gasoline refining and marketing firm, created as ConocoPhillips split into two companies. ConocoPhillips kept the current name of the company and concentrated on oil exploration and production side while Phillips 66 included refining, marketing, midstream, and chemical portions of the company. Photo: Hugh Pickens all rights reserved. For nearly 100 years oil refining has provided the bedrock of Ponca City's local economy and shaped the character of our community. Today the Ponca City Refinery is the best run and most profitable of Phillips 66's fifteen worldwide refineries. The purpose of this collection of reports is to provide a comprehensive overview of Phillips 66's business that documents and explains the company's business strategy and execution of that strategy. How Much Money Does Ponca City Earn for Phillips? This page was last modified on 10 April 2018, at 23:48. This page has been accessed 28,484 times.